It's terribly easy to get lost in Emil Johansson's Lord of the Rings Project, an extensive series of charts, maps, and genealogies analyzing J.R.R. Tolkien's Middle Earth. 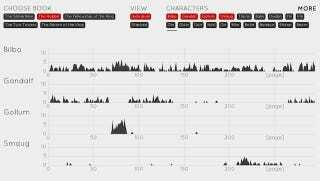 His latest update to the project is a real treat: a statistical analysis of the appearance of words and characters in The Lord of the Rings, The Hobbit, and The Silmarillion. You might just spend the rest of your Sunday searching for every appearance of the terms "Mordor," "Precious," and "Second Breakfast." Johansson's latest series of data visualizations gives us tons of analyses to choose from: the word count and unique word density of each book, where and how frequently the major characters are mentioned, a searchable series of charts displaying where in the books certain keywords appear, graphs of whether the sentiments expressed across the books are positive, negative, or neutral, and much more. Johansson's data-centered take on Tolkien's books is always fascinating, and sometimes it reveals some surprises about the books that we may not have so clearly understood otherwise. For example, The Hobbit appears much more concentrated in its angst than the Lord of the Rings books.